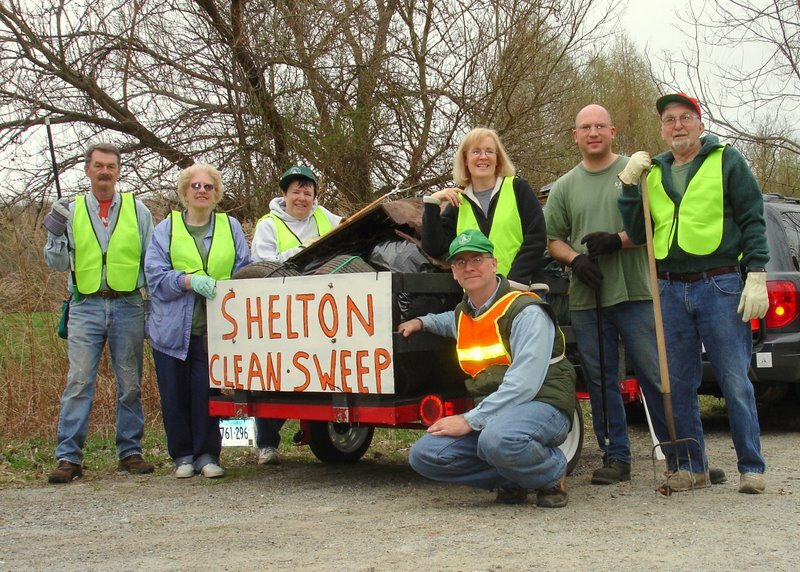 Please give a big THANK YOU to everyone who helped clean up Shelton, whether they are listed below or chose to remain anonymous. Click here to see photos and here for a map showing the cleanup locations that were reported to us. Boy Scout Troop 28 removed 1500 pounds of trash (mostly metal) and 31 tires from the open space near the new Dog Park. PerkinElmer removed 15 bags of litter from Isinglass Road AND another 25 bags from Booth Hill Road as well as other items including a mattress. VOLUNTEER OF THE YEAR: INDIVIDUAL OR FAMILY & FRIENDS CATEGORY: George Waters. George fills up his kayak and canoe with litter from the Housatonic River repeatedly throughout the year. TestAmerica cleaned up Forest Parkway, removing 25 bags of litter, a computer printer/scanner, a VCR, tire rims, and a mysterious large glass bulb. This is the fourth year in a row that TestAmerica has gone “above and beyond” our expectations. 1. Girl Scout Troop 58 cleaned up Booth Hill School. They noticed a lot of cigarette butts! 2. Girl Scout Brownie Troop 60086 picked up litter at Booth Hill School. 3. Mason Burr picked up half a bag of litter at Booth Hill School. 5. The Shelton High Green Tees Club filled up a couple of big bags at the Nike recreational fields. 6. The Belden Family picked up a bag of litter near the intersection of Long Hill Ave and Constitution Blvd South, including Constitution Park. 8. Girl Scout Troop 60373 filled up 3 larges bags with litter from Booth Hill School. 9. Huntington Wood Community volunteers picked up 3 bags of litter from Scotch Pine Drive, Crab Apple Circle, and part of the Rec Path. 10. Girl Scout Troop 61588 removed 3 bags of litter from Constitution Blvd. North. 11. Cub Scout Pack 25 filled up 3 large bags of litter at Long Hill School. 12. Mike and Joey Romano removed 3 big bags of litter from East Village Park. 13. The Long Hill Neighborhood Kids picked up 3 bags of litter along Long Hill Drive from Laurel Wood Drive to Long Hill School. They found lots of cigarette butts from people throwing them out of their cars. 14. Girl Scout Troop 60766 removed 4 large garbage bags and one folding chair from the grounds of Perry Hill School. 15. 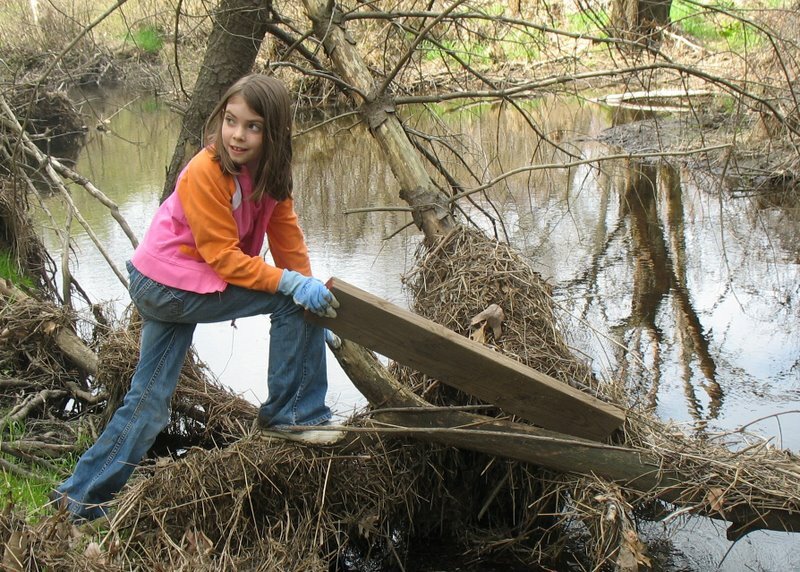 Girl Scout Troop 60012 filled 4 garbage bags and pulled out a tire from the High School ballfields. 16. Girl Scout Daisy Troop 60730 removed 5 bags of trash from Elizabeth Shelton School. They found lots of insulation. 17. The Spillane Family picked up 120 pounds of trash from Perry Hill Road. 18. The Roving River Rats filled up 5 bags and collected a pile of debris that included 5 tires, a bunch of plastic, and some ceramic pipes along Indian Well/Birchbank Road. 19. Salento Farm volunteers removed 5 bags of litter, some metal, and a tire from Birdseye Road and the corner at Route 110. 20. Boy Scout Troop 101 removed 6 big bags of litter and a dead rat (!) from Research and Progress Drives. 21. Girl Scout Troop 60061 removed 6 bags and a tire from Shelton High School. They found lots of Dunkin Donuts coffee cups. 22. Girl Scout Troop 60062 & Family removed 6 large bags from Long Hill School as well as an inflatable boat. 23. Cub Scout Pack 24 filled up 6 bags at Booth Hill School. One Scout found a dollar! 24. Boy Scout Troop 55 filled up 7 garbage bags at Shelton High. 25. Girl Scout Troop 61094 filled up 7 shopping bags at Elizabeth Shelton School. 26. Sunnyside Scouts removed numerous bags and pipes from an old playground from Sunnyside School. 27. Cub Scout Pack 38, Den 3 picked up Oak Valley Trail again this year. They have been cleaning this location for four years. They removed 8 bags of garbage, along with a car battery, a rubber boot, and a mail box. 28. Well Spring Estate Homeowners Association filled up 9 large bags from Old Stratford Road and the Far Mill River. They found lots of plastic bottles and fishing equipment. 29. Girl Scout Cadette Troop 60053 removed 22 bags of litter from Constitution Blvd South and say they could have picked up more but they ran out of bags. There were a lot of empty alcohol bottles. 30. Cub Scout Pack 27 cleaned up East Village Park, removing 30 large bags, a sofa, steel scrap and a barrel.